When it comes to our skincare a routine is essential. We need to rebuild the barrier of our skin in order to keep it healthy and maintain it. When our skin is healthy we can focus on fixing on any disorders such as Acne and premature ageing. One of the biggest questions we get asked here in Amara is what skin care routine should I be doing? AND How long will it take Though this will vary with every person the basic routine stays the same. 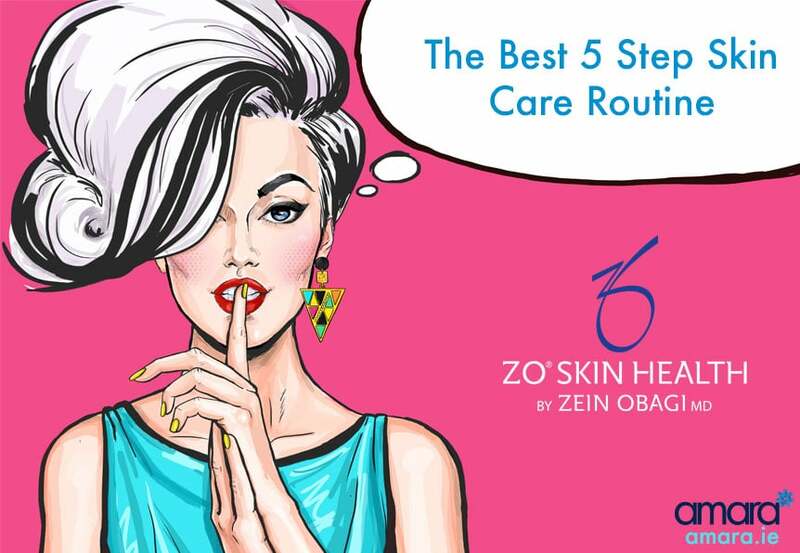 This 5 step routine with ZO Skin can be added to and adapted depending on what your skin needs. Exfoliating Cleanser contains exfoliating beads to remove dead skin cells, encapsulated vitamin E as an antioxidant, Jojoba beads to help hydrate the skin and Salicylic Acid to keep pores clear. Oilacleanse contains a higher solution of salicylic acid making it ideal for those who suffer with oily skin, Acne or breakouts. Salicylic acid also works to keep pores clear and appear smaller. Bursting red beads of Vitamin E adds antioxidants and protection to the skin. Tea Tree oil works to help inflammation or redness in the skin. Other cleansers with targeted ingredients or gentler properties are also available for other skin types. Exfoliating Polish uses tiny magnesium crystals to thoroughly exfoliate the skin and give the benefits of an at home microdermabrasion. Weekly exfoliation can help with cell turnover and increase your cellular renewal for a more even toned complexion as well as preventing pores from being clogged and help your skin absorb other ingredients. Use exfoliating polish once a week (If advised) after cleansing and before oil control. Cebatrol Oil Control Pads are used after cleansing the face, containing high strength Salicylic as well as Glycolic and Mandelic Acid, 3 Proven Exfoliants. 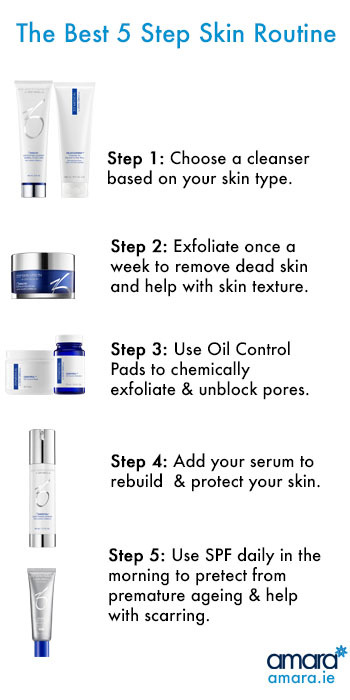 Chemical exfoliants smooth your skin’s surface while clearing out pores and reducing irritation. Use for Acne, Blemishes, Oil Reduction and exfoliation, once or twice a day depending on your skin. These pads are dabbed gently around the face or area needed after cleansing. Daily Power Defence is the ultimate serum when it comes down to it nearly everyone on the ZO Skin Health range will use this. As a rule the ZO Skin Care range does not offer moisturisers as they clog the skin and disrupt the barrier of our skin making it unable to produce its own hydration. Daily Power Defence Cream contains Retinol and Vitamin E.
Retinol takes time to restore the skin barrier and a a result will likely causes shedding when it is starting on the skin, this is how our skin repairs itself. For every skin type SPF is essential, even if you think you rarely see the sun the UV rays still pierce through the clouds and touch your skin. Not only outside, Blue lights emitted from computer screens and phones are now in constant close contact with our skin. Daily SPF prevents premature signs of ageing, sun damage, pigmentation and can even help with scarring. Smart Tone SPF 50 contains colour beads that adapt to your your own skin tone so you are not left with a ghostly look. Depending on what you like ZO Skin Health offers a wide range of other SPFs like SPF 30 + with matte primer or Smart Tone Sheer which offers a matte finish . SPF should always be the last step of your skincare routine before your makeup and should be done in the morning before going outside and topped up throughout the day if in sunny weather. Depending on your own skin conditions there’re plenty of product that can be added on for Acne, Pigmentation, Ageing, Eye Bags, Rejuvenation etc. The Zo Skin Health and medical Family is only available with a consultation from one of our skin therapists so book in now to start your skin journey!